PayrollPanda — What's the meaning of the different categories under payroll items? Help Center Home App What's the meaning of the different categories under payroll items? What's the meaning of the different categories under payroll items? 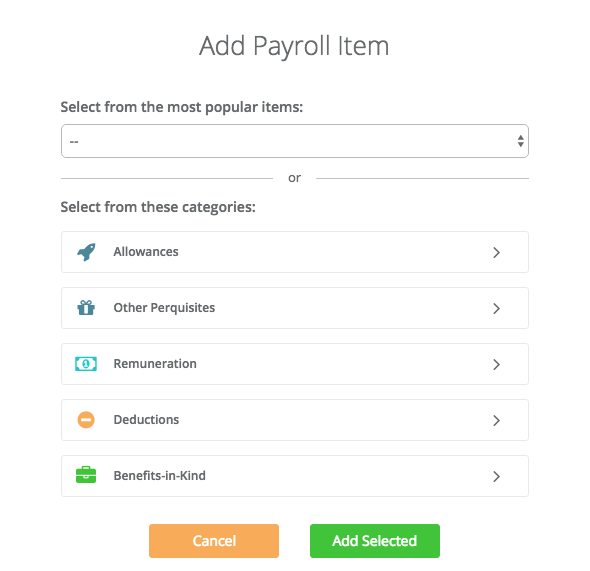 We pre-setup the most common payroll items for you in the PayrollPanda app. Each payroll item falls under one of the following categories, which are further explained below. Read this article to learn how to add payroll items in our app. A type of cash perquisite which is a fixed payment to the employee for specific purposes during the course of employment (e.g. Petrol/Travelling Allowance, Child Care Allowance etc.). Allowances also appear on the employee's payslip and are included in total gross pay. Benefits in cash or in kind which are convertible into money. Cash perquisites are usually included on the employee’s payslips while non-cash perquisites are not, though they may affect the amount of PCB payable by the employee. Cash payments including wages, arrears of salary and incentives. Incentives are performance-related payments such as quarterly or annual bonuses, monthly commissions, profit sharing and gratuity. These payments are included on the employee’s payslips to make up the total gross pay. Deductions like unpaid leave or loan repayments are reductions of an employee’s gross pay withheld by the employer. Other deductions like parental relief or fees paid to a child care centre do not appear on the payslips but can reduce the amount of PCB payable by the employee. Unlike perquisites, BIKs are not convertible into money. This means that when the benefit is provided to the employee, that benefit cannot be sold, assigned or exchanged for cash either because of the employment contract or due to the nature of the benefit itself. Typical examples for benefits-in-kind would be a company car, a driver or living accommodation. They do not appear on the payslip but may still affect the amount of PCB payable by the employee.